Lee Beeson scored twice from the spot as Spalding United beat Chasetown. Lee Beeson was spot-on as promotion-chasing Spalding United pipped Chasetown in Division One South of the Evo Stik Northern Premier League at the Sir Halley Stewart Field yesterday (January 28). The second-placed Tulips fell behind midway through the first half, but Beeson converted two spot-kicks, one either side of the break, to keep his side six points behind runaway leaders Shaw Lane and eight points clear of third -placed Witton Albion. Witton have seven matches in hand! 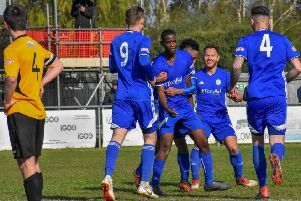 Stamford AFC were expected to challenge for honours at this level following their relegation from the Premier Division last season, but instead they’ve struggled throughout a tough league campaign. And it continued yesterday as the Damiels lost 1-0 at home to Belper, the winning goal arriving two minutes before the break. Stamford are 15th in the table. March Town United have confirmed their management team of Mel Matless and Roy Brand will stay in charge next season. Yesterday the Hares were crushed 5-0 at second-placed Stowmarket in Division One of the Thurlow Nunn Eastern Counties League. Wisbech St Mary were beaten 4-1 at home by Woodbridge Town in the same division. Stamford AFC 0, Belper 1. Wisbech St Mary 1, Woodbridge Town 4.